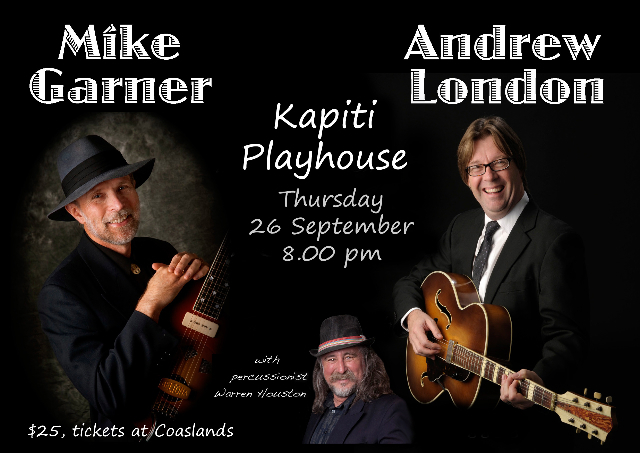 Mike Garner and Andrew London play the blues - Kapiti Playhouse Inc.
Mike Garner & Andrew London come to Kapiti Playhouse on Thursday September 26th to play the blues along with percussionist Warren Houston. 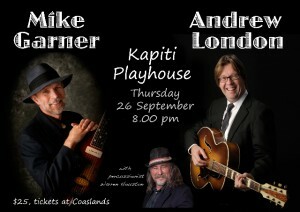 The performance kicks of at 8pm and tickets are available for $25 from Coastlands and also online at TicketDirect (service fees may apply). Andrew’s previous shows have been very well attended so don’t leave it to the last minute to purchase your tickets!